Replacing the M27 recoilless rifle, the M40 primarily saw action during the Vietnam War and was widely used during various conflicts thereafter in Africa or in the Middle East. It was replaced by the BGM-71 TOW anti-tank missile system in the US armed forces. 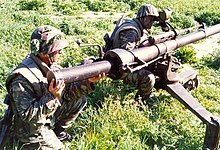 The earlier M27 recoilless rifle was a 105-mm weapon developed in the early 1950s and fielded in the Korean War. Although a recoilless rifle of this caliber had been a concept since the Second World War, the weapon was hurriedly produced with the onset of the Korean War. The speed with which it was developed and fielded resulted in problems with reliability caused by trunnions that were mounted too far to the rear. The M27 was also considered too heavy by the U.S. Army and had a disappointing effective range due to the lack of a spotting rifle. Taking the M27 as the basis for a new design, the Army developed an improved version of the M27 that was type-designated the M40 106-mm recoilless rifle in 1955. Although unsuitable for military purposes, M27 recoilless rifles were used to trigger controlled avalanches at ski resorts and mountain passes in the United States. A special vehicle called the Ontos carried six M40s. A version specific to the T195E5 mount, the M40A1C, was used. It was used only by the U.S. Marine Corps. Japan produced a self-propelled gun called the Type 60, which carried two side by side. Some Pakistani M113s have a dual mounting. Three Panagopoulos coastal patrol boats class of the Hellenic Coast Guard and the Hellenic Navy in service of 1976-2003 was armed with two sextuples M40. The M40 was a very successful export item and continues to be used by South Korea, Ecuador, Estonia, Greece, Honduras, Iran, Lebanon, Malaysia, Mexico, Morocco, the Philippines, Taiwan, Turkey, Colombia, Venezuela and many others, as well as anti-government forces in the Libyan Civil War and Syrian civil war. It is manufactured in Iran by Defense Industries Organization. The M40A1 was also copied in China as Type 75. The ammunition for the M8C spotting rifle is not .50 BMG, but a round often refereed to as .50 BAT (Battalion Anti Tank), which is 12.7x77mm. .50 BAT was developed to replicate the trajectory of the 106 mm ammunition, and features a tracer element and a point-detonating incendiary filler to create a puff of smoke at the impact point. Although the spotting rifle could conceivably be used in an antipersonnel role, historic U.S. military doctrine strongly discouraged this use, for a purely tactical reason—to conceal the vulnerable M40 and its crew from the enemy until the main rifle was ready to fire. However, this restriction is believed to be the source of a long-standing misconception that the laws of war restrict the use of .50-caliber projectiles against enemy personnel more generally. Angola: used by mercenaries of FNLA on Land Rovers and by UNITA. Argentina - Fielded in the Falklands War. Australia: replaced the 6-pdr gun from 1961. Remained in service into the 1990s and in limited use in Afghanistan. Denmark: remained in limited service in Afghanistan. Myanmar: more than 1,000 M40A1 RCLs in service as of 2016[update], used for bunker busting and anti-personnel/infantry support role in counter-insurgency campaigns. South Korea: Locally produced. Still in service in 2016. Switzerland: In the period 1958–1990, the antitank companies of the Swiss Army Infantry Regiments were equipped with 12 M40 guns. ^ Higgins, David R. (20 Jan 2016). M48 Patton vs Centurion: Indo-Pakistani War 1965. Duel 71. Osprey Publishing. p. 71. ISBN 9781472810922. ^ a b Dunstan, Simon (10 Oct 2009). The Six Day War 1967: Sinai. Campaign 212. Osprey Publishing. p. 77. ISBN 9781846033636. ^ a b Neville 2018, p. 20. ^ a b Neville 2018, p. 15. ^ a b Neville 2018, p. 16. ^ Neville 2018, p. 21. ^ Neville 2018, pp. 40, 42. ^ a b c d e f McNally, Brendan (May 31, 2013). "Ancient U.S. Weapon Makes a Surprise Reappearance in Syria". Wired. ^ a b Neville 2018, pp. 12, 34-35. ^ "La 52ème brigade de la mobilisation populaire chiite, milice turkmène pro-iranienne en Irak". France Soir (in French). 16 August 2017. ^ a b Neville 2018, p. 38. ^ U.S. Army Technical Manual 43-0001-28, p. 5-27, April 1994. ^ "M40 - Weaponsystems.net". weaponsystems.net. ^ "M40 RR 106mm Recoilless Rifle - United States". ^ Pike, John. "M40 106mm Recoilless Rifle". www.globalsecurity.org. ^ Bob Stoner GMCM (SW) Ret. (2005). "M40A1 106MM Recoilless Rifle with M8C Spotting Rifle". Archived from the original on 2013-09-10. Retrieved 2013-09-04. ^ "M40 106mm Recoilless Rifle". globalsecurity.org. Retrieved 2012-09-20. ^ John Weeks, Men against tanks, New York: Mason/Charter, 1975. ^ Comment by Ken Estes at tanknet.org Archived 2013-05-27 at the Wayback Machine. ^ "Armament Industries Group". diomil.ir. 2006. Archived from the original on 2012-01-20. ^ a b Neville 2018, p. 12. ^ "M40 106mm recoilless Rifle". M40 106mm Recoilless Rifle. Global Security. Retrieved 27 January 2014. ^ Probably defeats ~ 200 mm of armor. ^ After penetrating explosive reactive armor. ^ Parks, Maj W. Hays (January 1988). "Killing A Myth". Marine Corps Gazette. Archived from the original on 28 February 2014. Retrieved 20 February 2014. ^ Fitzsimmons, Scott (November 2012). "Callan's Mercenaries Are Defeated in Northern Angola". Mercenaries in Asymmetric Conflicts. Cambridge University Press. p. 139. doi:10.1017/CBO9781139208727.005. ISBN 9781107026919. ^ "Projectile – 106mm recoilless rifle" (PDF). defence.gov.au. Defence unexploded ordnance website: ordnance information sheet. March 2015. ^ a b c d e f Small Arms Survey (2008). "Light Weapons: Products, Producers, and Proliferation" (PDF). Small Arms Survey 2008: Risk and Resilience. Cambridge University Press. p. 23. ISBN 978-0-521-88040-4. ^ Military Balance 2016, p. 322. ^ Military Balance 2016, p. 236. ^ Military Balance 2016, p. 380. ^ Military Balance 2016, p. 383. ^ a b c d e f Wiener, Friedrich (1987). The armies of the NATO nations: Organization, concept of war, weapons and equipment. Truppendienst Handbooks Volume 3. Vienna: Herold Publishers. p. 484. ^ Military Balance 2016, p. 436. ^ Ansar (26 May 2013). "World Military and Police Forces: Comoros". ^ Military Balance 2016, p. 387. ^ Military Balance 2016, p. 394. ^ Military Balance 2016, p. 398. ^ "sodur.com". Retrieved 13 February 2015. ^ Military Balance 2016, p. 91. ^ Military Balance 2016, p. 399. ^ Military Balance 2016, p. 104. ^ Military Balance 2016, p. 402. ^ Military Balance 2016, p. 257. ^ Military Balance 2016, p. 271. ^ Military Balance 2016, p. 452. ^ Military Balance 2016, p. 454. ^ Military Balance 2016, p. 343. ^ Military Balance 2016, p. 404-405. ^ Military Balance 2016, p. 460. ^ Military Balance 2016, p. 410-411. ^ Military Balance 2016, p. 284. ^ Military Balance 2016, p. 130. ^ Military Balance 2016, p. 351-353. ^ Military Balance 2016, p. 287. ^ Small Arms Survey (2012). "Surveying the Battlefield: Illicit Arms In Afghanistan, Iraq, and Somalia" (PDF). Small Arms Survey 2012: Moving Targets. Cambridge University Press. p. 342. ISBN 978-0-521-19714-4. ^ Military Balance 2016, p. 468. ^ Gordon L. Rottman (2010). Army of the Republic of Vietnam 1955–75. Men-at-Arms 458. Osprey Publishing. pp. 7, 34. ISBN 9781849081818. ^ Wiener 1987, p. 337. ^ Badri-Maharaj, Sanjay (2 February 2017). "Suriname's Armed Forces: Capability Compromised – Analysis". Institute for Defence Studies and Analyses. ^ Military Balance 2016, p. 412. ^ "Le Hezbollah libanais en Syrie: l'assaut contre la station T2 tenue par l'Etat islamique (Deir Ezzor)". France Soir (in French). 8 November 2017. ^ Military Balance 2016, p. 291-292. ^ Military Balance 2016, p. 293. ^ Military Balance 2016, p. 148. ^ Military Balance 2016, p. 414. ^ Military Balance 2016, p. 358. ^ Green, Michael. "Weapons of the Modern Marines". Zenith Imprint – via Google Books. Neville, Leigh (19 Apr 2018). Technicals: Non-Standard Tactical Vehicles from the Great Toyota War to modern Special Forces. New Vanguard 257. Osprey Publishing. ISBN 9781472822512.